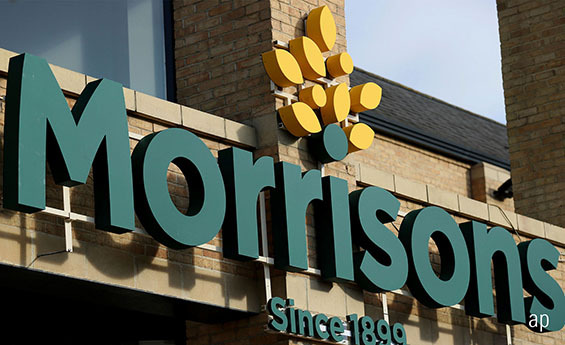 Morningstar analysts have upgraded their fair value estimate for FTSE 100 supermarket Wm Morrison (MRW) after half-year results showed a near-5% rise in like-for-like sales in the last six months. We are increasing our fair value estimate to 208p per share from 202p to reflect higher retail growth for the 2019 financial year, but we still view the shares as overvalued. We think the shares, at almost 20 times 2019 earnings versus 17 times for Tesco (TSCO) and 16 times for Sainsbury's (SBRY), are still expensive and reflect the likelihood of Morrisons being an acquisition target for Amazon (AMZN). Although sales growth was higher than consensus forecasts, Morrisons’ management reiterated their financial forecasts for the full year. But we believe this rebound in sales volume growth this year may partially be supported by industrywide tailwinds such as good weather, the royal wedding, and the football World Cup. Management's efforts to improve the bottom line have been concentrated on increasing incremental profits through online, wholesale, services, and reducing debt interest payments. The company has saved £46 million to date with almost £4 million generated during the first half of this year, with a large portion coming from interest savings. We are changing our retail in-store like-for-like sales growth forecast for the 2019 financial year to 1.5% from 0.5% on improved trading momentum. However, we still see growth headwinds for Morrisons, especially in the later years of our explicit forecast period, as J Sainsbury-Asda and Tesco cut prices more aggressively and utilise their scale advantages. The recently announced proposed J Sainsbury-Asda merger should be a net positive for all traditional UK grocers in the longer term, with Morrisons benefiting as well, through higher buying power concentrated in the hands of retailers versus suppliers and opportunities for smaller grocers to increase their store network – from potential store disposals ordered by the competition regulator, the CMA – in below-market prices. Any future store acquisitions could drive changes to our valuation. This could involve potential CMA store disposal demands relating the to Sainsbury/Asda merger or a transformative business combination such as Morrisons' bid for another grocer or Morrisons being an acquisition target. Any valuation change would depend on depending on the transaction value and the assets bought.